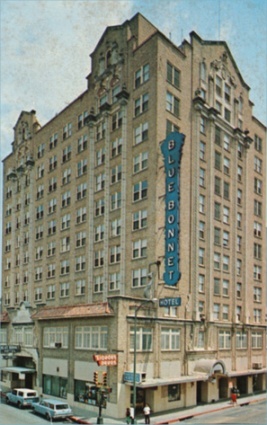 The Bluebonnet Hotel at St. Mary’s and Pecan street opens for business. San Antonio’s motorcycle patrolmen may soon be equipped with electric machine guns. C. A. Stockholm, their inventor, said he will give them to the police if the city approves. The guns are fired by the ignition switch. A benefit concert for “Fiddlin’ Frenchie” Burke is held at the Kendall County Fairgrounds in Boerne. Performers are: Moe Bandy & the Rodeo Clowns, Johnny Bush & the Bandeleros, Bubba Littrell & the Melody Mustangs and George Strait & the Ace in the Hole Band.